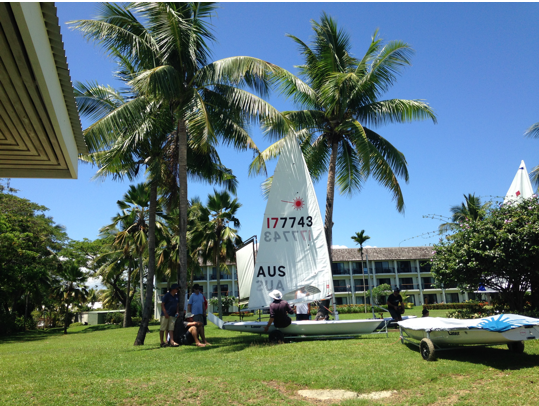 Laser sailors have been arriving as early as two weeks ago to Denarau Island, enjoying the sunshine, warm waters, and the sights of Fiji before the 2018 Oceania Laser Masters Championships begin. For those who have never been to Fiji, seen turquoise-colored water, or sailed in the trade winds, it has been hard to understand and adjust to operating on island time. But the Fiji locals are always happy and polite, and they say it helps them live longer. One Laser sailor from Holland sailed out to the outer islands, stopped at a small island resort to have a cold beer, and sailed back to base here at the Sofitel. To kick off the on-water events this week, Australian Brett Bayer is running a camp coaching a group of Laser sailors. Yesterday, we were also joined by some of the local Fiji sailors, while others are getting used to sailing their brand new PSA Lasers. The day before we start a new event in a different country, it is all about preparation of the equipment, buoys, rescue boats, and start boats. This has all come together under the guidance of Peter Merritt PRO and Neville Koop OLCA Committee member. Early publicity here is in full swing with TV coverage and a full page article in the National Paper. TV will be returning throughout the week, as Sullen Davies from New Zealand arrives with a drone and will interview sailors and officials. The coming week looks to be full of great sailing, long happy hours, high-quality media coverage, and spectacular weather for sailing. The real reason we are here.